I'm in a little bit of a coat phase. I keep seeing more coats that I like and I keep convincing myself that I need (want) them. I absolutely love a great camel coat. Some people argue that they are just a trend, but I find them timeless and classic. They can be thrown over distressed jeans and a white t-shirt and look effortless. Plus, you will be rocking that whole French girl chic/ I'm trying but not really look. Of course you can splurge a coat too. But, due to my growing coat collection, Zara is working just as well for me. 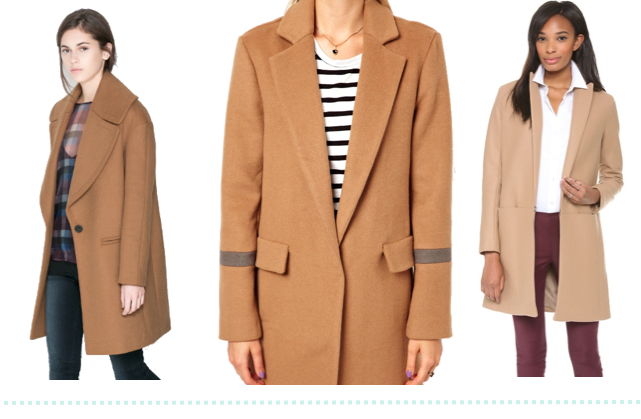 I want a camel colored coat and these are such great picks! I definitely also have a jacket/coat addiction. My friends joke that I own eight of the same coats, but they miss the subtle differences (I know I know these are words of an addict). The camel coat is such a versatile staple.